1 Corinthians 13:1-13 may be one of the most well-known passages of the Bible, but how often do we consider what it may be saying to us as leaders? At the most recent Faith and Life Gathering, we were invited to do just that. 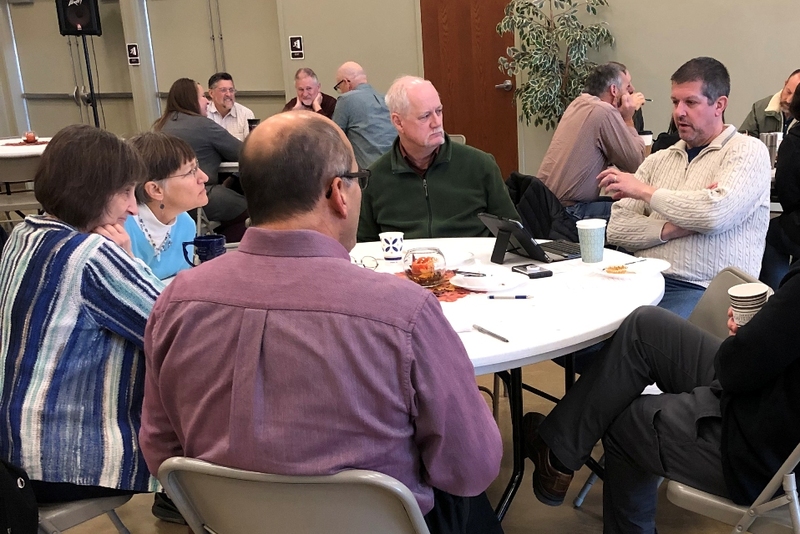 As we sat around tables at Finland Mennonite Church, we shared the words and phrases that jumped out at us as we read. “Love is patient. Love is kind. It does not boast; it is not proud…. Love is not easily angered…. Love rejoices with the truth.” Many of us admitted our human struggle to lead from a place of love instead of leading from the desire to perform well, experience success, or receive the praise of people. 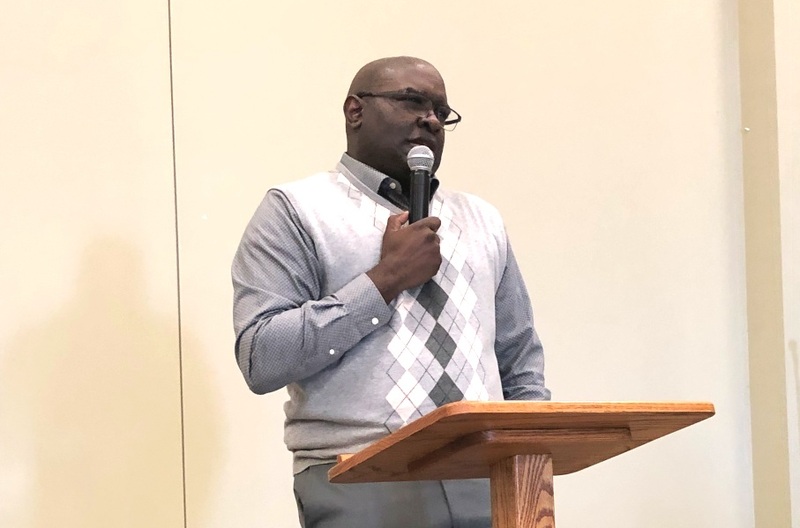 The morning’s presenter, Leonard Dow, explored the theme of love and leadership as he spoke to us from the stories of Jesus’ baptism (Matthew 3:13-17) and his transfiguration (Matthew 17:1-13). He reminded all of us that Jesus was loved by God before he accomplished or achieved anything; he was loved simply because he was God’s Son. What a powerful reminder to those of us who serve in ministry week in and week out: What we accomplish or fail to accomplish does not change our identity as the beloved of God. In table groups, we discussed questions about leading from love: When have we sensed God’s unconditional love? How did we respond to it? When have we been motivated by something other than love? What challenges do leaders who desire to lead from love face? There was a level of vulnerability to our conversation that felt healing. As we prayed for each other, God’s overwhelming love surrounded and held us. Leonard told a story of a preacher who welcomed his congregation by saying, “I want you to know I love you and there’s nothing you can do about it.” I left that morning hearing God say to my heart, “KrisAnne, I want you to know that I love you and there’s nothing you can do about it.” If I hit a sour note in a song, preach a lousy sermon, and fail to respond well to someone—or if I play perfectly, preach an inspiring sermon, and say exactly the right thing at the right time—I am still loved as I have always been loved. This may become my new mantra. I sense that if this one truth sinks into my soul this coming year, it could have a powerful impact on my ministry, my relationships at home, and in my community. I am loved. You are loved. We are all loved. God empowers us to live and to lead from love. Leonard Dow is the former pastor of Oxford Circle congregation in Philadelphia and now works for Everence. Watch Leonard’s full presentation here. 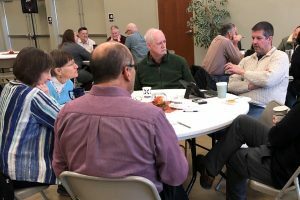 Faith and Life gatherings are held quarterly so that Franconia Conference credentialed leaders can pray and study Scripture together. The 2019 dates will be February 6 & 7, May 8 & 9, and August 7 & 8.